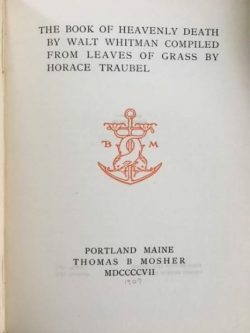 The Book of Heavenly Death by Walt Whitman Compiled from Leaves of Grass by Horace Traubel. Walt Whitman – Mosher Press. Portland Maine: Thomas B. Mosher, 1907. 2nd edition. 8Vo. Charcoal blue hard boards. Paper spine label. Limited to 500 copies on Van Gelder paper. Small bookplate. Small splits, top and bottom front joint. Otherwise a Good, tight and bright copy. No markings. $45.00 Postpaid to a US address.